You heard it right, 2019 trends are finally here! 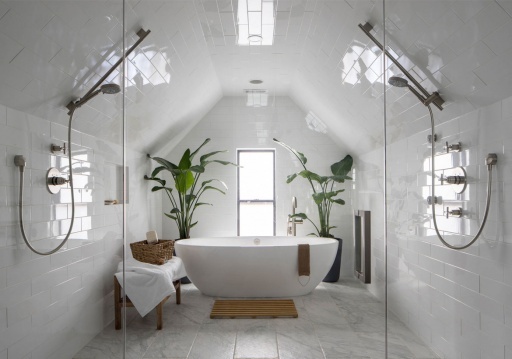 To kick off the batch of articles we will be releasing over the next couple months is our 2019 Bathroom Design Trends. 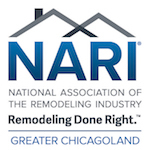 Get the inside scoop on the most up to date styles in the industry and find some inspiration for your next bathroom remodel! From bathtubs and showers, to sinks and vanities, we got you covered. The newest textures, patterns, prints, finishes, and styles of all sorts are here for the coming year. This round-up contains the hottest designs that can give you the right type of inspiration you didn’t even know you needed. Whether you are building a new home or planning a renovation, the list is sure to spark some creativity. 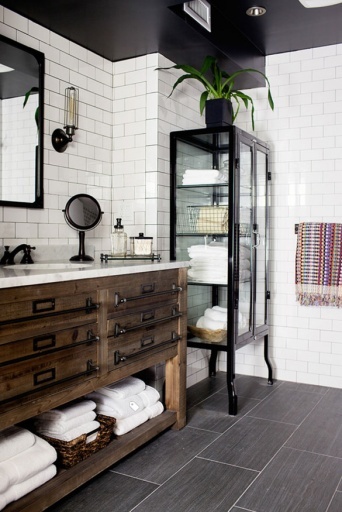 From chic and modern to industrial and vintage, whatever your personal style may be, 2019 is your year for bathroom remodeling. Grey may have been one of the most popular styles in 2016 and 2017 bathroom remodeling projects, however, that’s all about to change.We’re moving on to bolder, darker styles this season. Grey is great, but black is better! In our Top Trends for Bathrooms of 2018 article we stated that darker tones were starting to pick up and that it would continue to gain popularity. Well guess what? Their time is now! That’s right, darker tones, specifically black, are here. 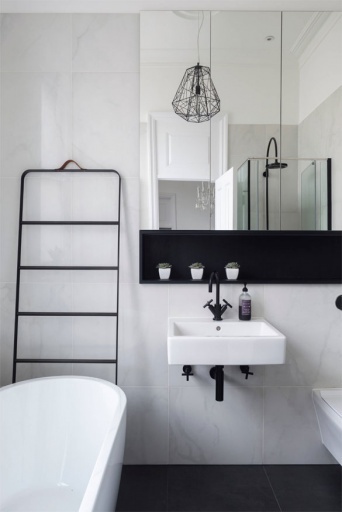 We saw so many grey bathrooms this past year, but expect to see an increase in black bathrooms.This trend is most popular in light fixtures, vanities, mirrors, and other fixtures- especially with matte finishes! Since some homeowners may be hesitant when it comes to adding these even darker tones to their homes, grey may continue to be a top choice for those looking to stray away from a classic white or neutral color, but aren’t quite ready for the boldness of black. Last year we talked about smart toilets, but this year the whole bathroom is getting a high-tech upgrade. In our 2018 articles we discussed high-tech toilets increasing popularity as a trend lead by Japan. The toilets saw things like seat warmers, automatic lid openers, adjustable air dryers, built-in deodorizers and more. If you were impressed with that technology, just wait till you hear about the rest of the bathroom. In 2019, bathrooms will see smart showers, mini fridges, and automatic sinks. We recently remodeled a home that allowed for the homeowner to set his shower to start automatically. This means by the time he got home from work, his shower was hot and ready! Another more common trend is the built-in bluetooth speaker system. Now you can easily jam out or wind down with the sounds of your shower. Voice activated features for lighting and temperature, smart mirrors that talk to you, and increased TV installments are just a few of the other fun trends we’ve seen, but the possibilities are endless. 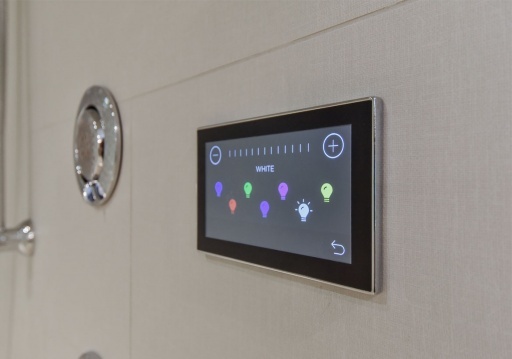 Modern day bathrooms are transforming into personalized day spas, and these technologies make the experience more relaxing and convenient than ever before. 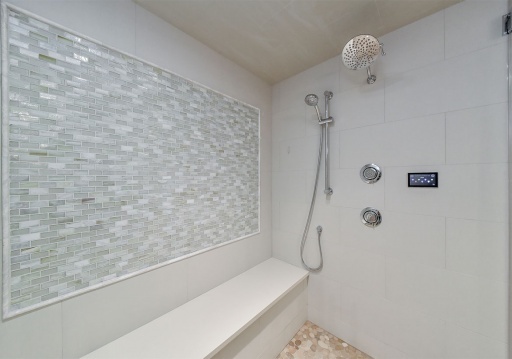 This shower setup allows users to easily customize their lights, temperature and more! 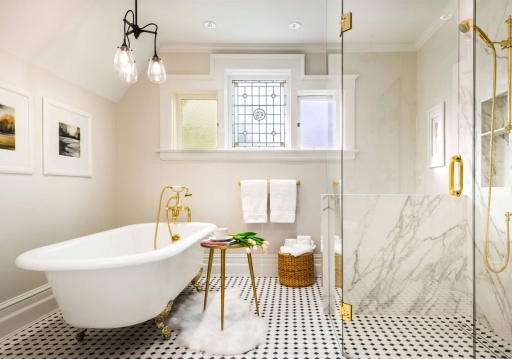 This image by Society Hill Modern Bathroom perfectly encompasses the idea of golden fixtures making a vintage statement in a modern day setting. While this style may not be for everyone, it’s very current and you should expect to see an increase in popularity for this type of design with the coming year! 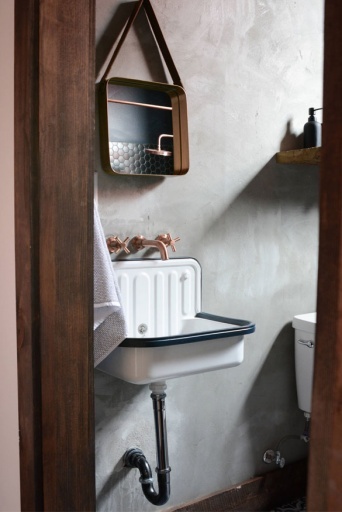 With all the metal finish possibilities, wooden accents, and funky tile patterns, it only makes sense that the industrial vanity is in. Its sleek and modern look fits in perfectly with this edgy, yet classy remodeling trend. 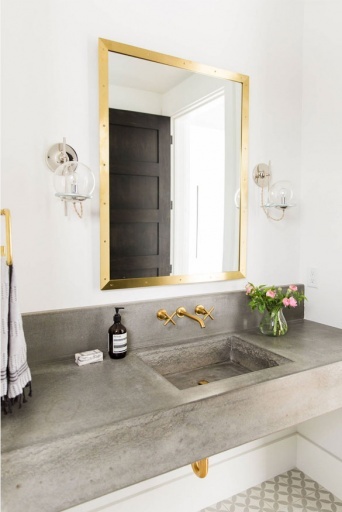 Industrial sinks can be matched with pop’s of colors, gold or brass accents, matte black fixtures, and fun tile patterns to modernize the look even more. 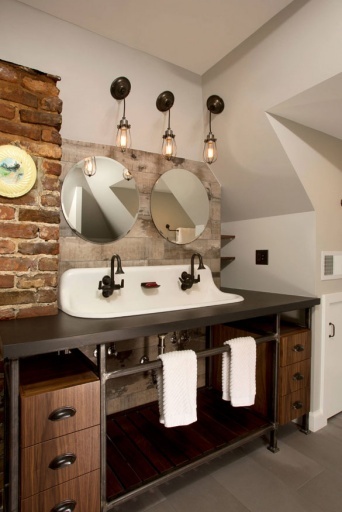 Industrial vanities are a great look for smaller apartments or your hall bathroom. This urbanized and trendy style is sure to make a statement in 2019, so don’t miss out!. As mentioned early in this post, grey is slowly making it’s way out of home remodeling trends. With this comes the return of warmer tones and accents- specifically wooden ones! 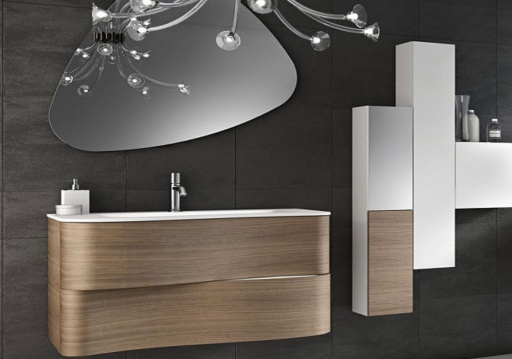 Various shades of wood can compliment white, blue, green, and darker colored bathroom. Practically anywhere! Wood accents pair nicely with vintage and industrial trends so it’s no surprise that they’re popping up again. 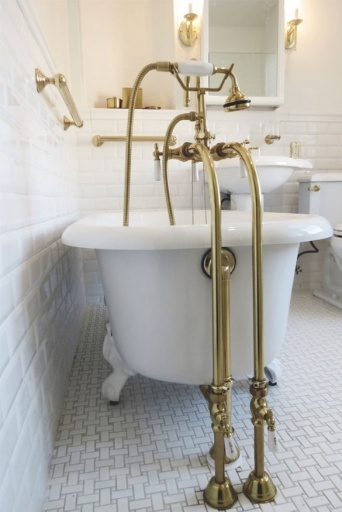 This look adds a classically traditional style to you other wise trendy and modern bathroom. We’re seeing it in unique styles too! 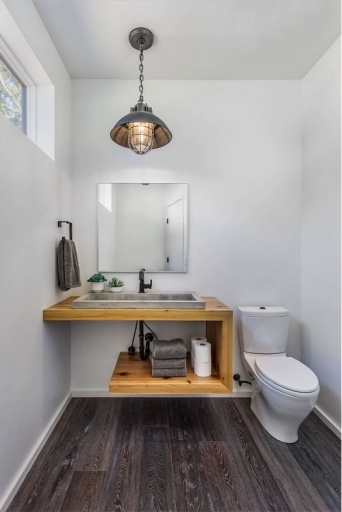 Some of the pictures below showcase just a few of the possibilities available when choosing wood tones for your 2019 bathroom remodel. Check it out! Sick of over crammed, messy cabinet spaces? So are we. 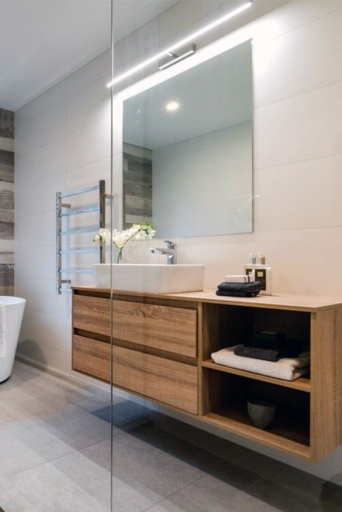 2019 Bathrooms will display simpler ways of life as they minimize item storage and the space required. Compacted storage areas, cabinets, shelves, etc. will be presented in a simplified manner that promotes minimalist habits. This lifestyle is believed to help relieve stress and keep you ore organized. Even if your other rooms are not as minimal, the bathroom is a relaxation sanctuary and compact storage can effectively provide just that. 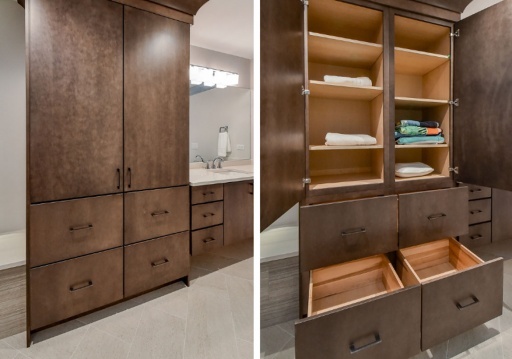 Hidden cabinets, modern wall shelving, and vanity under space storage will appear less cluttered, allowing the entire bathroom to feel more open and organized. As we continue to stray further and further from gray tones, we expect to see an increase of colorful accents, fixtures, and accessories in bathrooms. These pops of color pair nicely with a neutral shade, either light or dark! 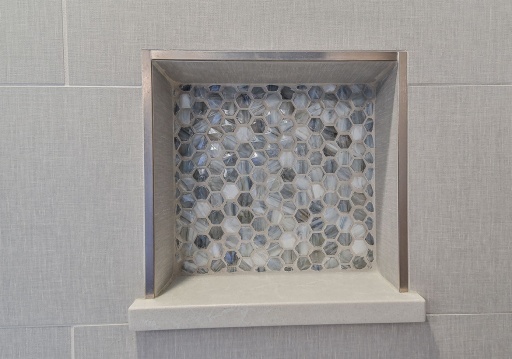 You may have heard of green or blue kitchens becoming more popular, and while this is true, expect to see those colors in upcoming 2019 bathroom remodels. The specific color chosen can be used to set various moods. 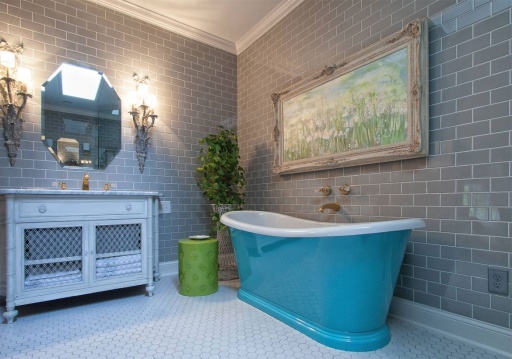 For example, pops of blue in homes is said to increase relaxation levels. On the other hand, green brings about the feelings of nature and wellness. Other colors may even boost your mood and creativity levels. This is a fun way to add a unique touch to your otherwise blah bathroom! Which color would you want to add during your 2019 bathroom design remodel? When it comes to color options for 2019 design trends, there’s some we prefer in a pop, and then there’s some we want all over. 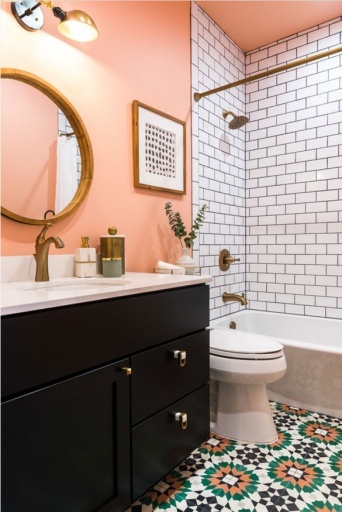 Shades of blush will continue to prevail in 2019 bathroom trends. 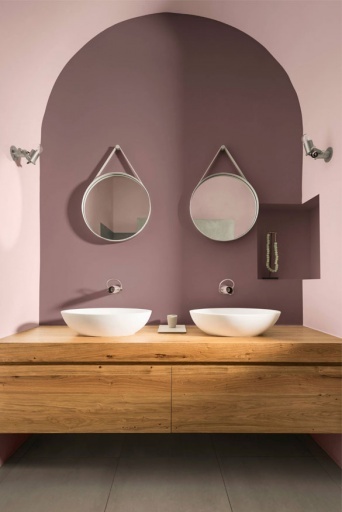 Blush is one of the most popular wall color choices for modern bathroom walls. Another notable trend that isn’t quite there yet, but slowly starting to reveal itself is rose gold. This color will soon not just be for your latest Iphone, but also for faucets, drawer pulls, and even bathtubs. Keep your eyes peeled, we expect to see this become quite trendy in the next few years. Until then, enjoy blush! Blush can come in an array of shades! Painted by Dulux. As the bathroom changes, the possibilities for expansion and more space come to mind. In fact, the goal of having more space is oftentimes the number one reason why homeowners choose to remodel. This includes the bathroom too! With compact storage options, you give yourself more room to expand on the bath or shower. Asymmetrical Mirrors are here and better than ever before. Unique and geometric mirror shapes are all the buzz, but that’s not all! Mirrors, just like the rest of the bathroom are becoming smarter. Mirrors can have anti-fog technologies, smart touch abilities, USB charging stations, and just about anything else you can imagine. Long gone are the days of plated mirrors. With shaped frame options taking over, you have the ability to get as creative as possible when it comes to picking out the exact style. And we have not forgotten about the most important detail of bathroom mirrors- lighting. It’s all about the lighting. Getting ready in your sleek and stylish bathroom would mean nothing if you didn’t come out looking flawless, right?! While we all love the idea of fun shapes and gadgets, functionality is at the top of our list. This is why we are seeing contemporary back lit mirrors as well a front lights increasing in popularity. 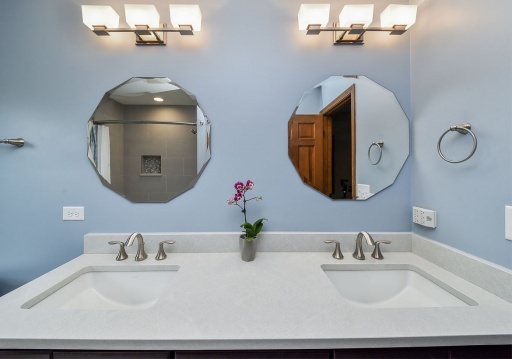 Back lit mirrors are a more subtle option that will allow for optimal lighting. Lights in the front allow for more creativity, but may distract away from an asymmetrical mirror shape.Keep scrolling for some photo inspiration! If you bought a pair of slippers just to escape the cold sensation on the bottom of your feet while walking across your bathroom floor; then it might be a good investment for you to consider adding a heating system under your floor. When the temperatures outside are dropping–your wish could become a reality. Underfloor heating can be used with a variety of flooring options like: tile, concrete, vinyl, and wood to name a few. But in a bathroom, the cold tile can transform into a beautiful soothing warm floor. Heating systems not only provide heat, but they can also reduce noise levels and possible allergic reactions since there are no air currents disturbing dust.